Sewing up several hanger covers just seems to add a Victorian essence to an otherwise dull closet. 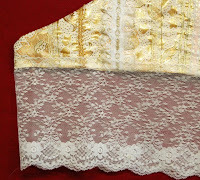 If you would rather a traditional look, sew it up in cottons and lace. Maybe use some scraps for a patchwork cover. 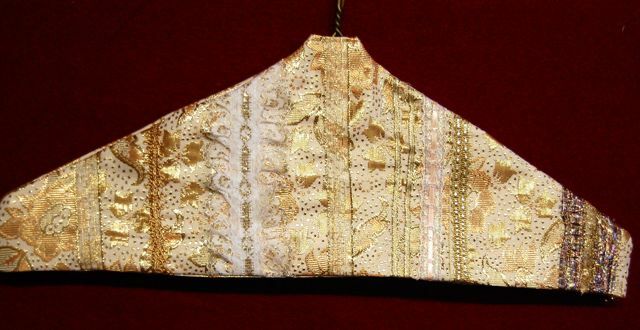 There are several ways to make one up - use only two pieces of fabric sewn right sides together or use four pieces to create a lining and more thickness. Directions for the lined hanger cover are below. use your pintuck foot and twin needles to embellish. add piping with your braiding foot. Use the gathering foot to gather lace for the bottom. Materials: 1/4 yard fabric, a variety and mixture of ribbons, cording/piping, lace, decorative rayon or metallic thread, marking pencil, hanger (I used a metal hanger). I do have a pattern drawn out, but for this one I simply laid the hanger on top my folded fabric. Trace around the hanger adding a 5/8" seam allowance and 3 additional inches at the bottom. At the neck of the hanger, go up about 2 inches, making a little 'chimney". You will turn this part down later. You now have 4 pieces cut out. Put two aside for the lining. With the marking pencil and long ruler, mark where you want your embellishments. Begin adding laces, piping, pintucks, anything you wish. I started on the front piece and when finished, did the back. If you have just a straight stitch machine, no problem. 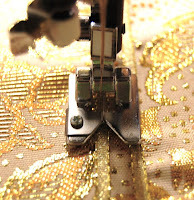 If you have some stitch patterns on your machine, give them a try! When finished adding those special touches, ready to finish up! Lay the front piece right side up, and a lining piece right side down. Sew the bottom only. Bring up to hide the seam and press. Repeat for the back piece. Turn the "chimney" under, folding the lining piece to the inside, and the front piece to the inside. 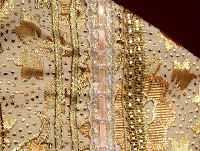 Pin and topstitch together. Repeat for the back pieces. Place the back piece wrong side up, the front piece right side down. Sew from the "chimney" to the bottom edge. Repeat for the other side. Turn and press. Add some lace to the bottom and you are finished!